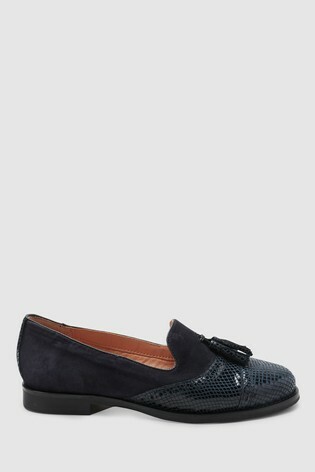 Is there anything more classy than a pair of clean cut loafers? Fashioned from real leather, this pair offers impeccable quality. These textured shoes are complemented by the snake effect on the toe and tassels. Designed with our Forever Comfort padding which features ultimate cushioning, flexi soles, soft padding that moulds to your feet as you wear and an extra padded heel. An ideal addition to your workwear wardrobe, a winning combination of style and comfort.